The cougar is the fourth largest wild cat, the largest wild cat in North America, the cat with the largest number of names and probably the best jumper of all the 36 wild cats. A celebrated former president of the United States, Theodore Roosevelt, complained about the confusing number of names. The cougar is also called the puma, mountain lion, panther and even painter and lion. There are more but I’ll stop there. The name is often used by sports teams to inspire good performances. Cougar Cat Facts For Kids. Credits photos top to bottom: Camera trap photo by USFWS Headquarters, Puma – Brazil – Photo by Greg S. Garrett, Photo copyright Anthony Gurr on Flickr, Copyright William Quatman. Globe: Wikimedia Commons (modified image). Although the cougar is generally bigger than the leopard it is not one of the big cats, which are the leopard, jaguar, lion and tiger. The cougar has very long and strong hind (rear) legs which gives it the ability to jump straight up a 20 foot cliff. The cougar can also run very fast at about 45 miles per hour when chasing animals. The cougar will kill and eat a mouse or a moose. It depends where it lives and what is there. In some areas such as South America it has to compete with the jaguar, a larger cat. In North America, when it kills to eat, 8 out of 10 times it will kill a deer that weighs about 90 pounds. In Central and South America the cougar normally feeds on smaller animals such as hares and smaller deer that weigh from about 2 to 33 pounds. When the cougar has eaten part of an animal it will hide the remains of the animal with leaves, snow or grass or anything it can find. This stops other animals eating its food. 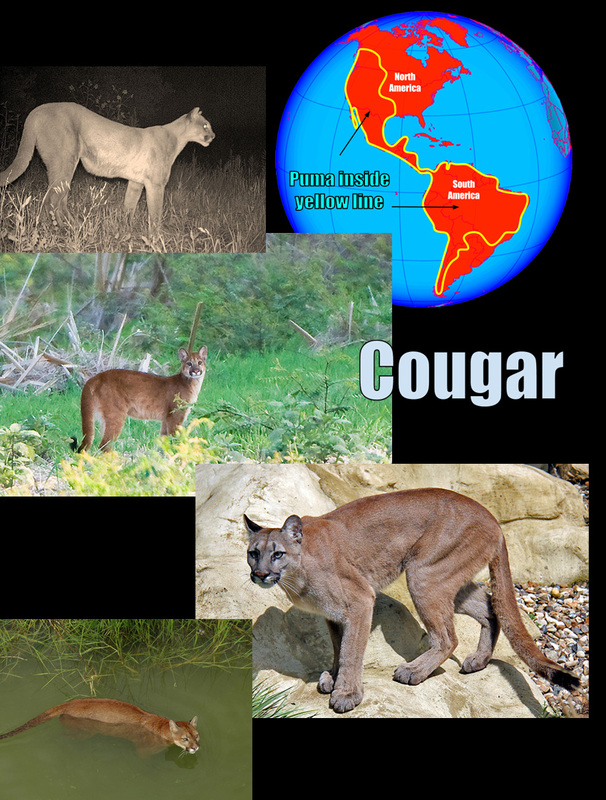 The cougar lives across the whole of the west side of the United States and Canada almost up to Yukon Territory. In the south it is found in Mexico, Central America and all the countries of South America in varying amounts. The cougar makes sounds like a domestic cat such as purr, meow, hiss, growl and a spit but they can’t roar like lions and tigers. They do make a scary screaming nose if they want to talk over a long range. A special type of cougar can be seen in Florida called the Florida Panther. There are only about 100 of these cats left in the world. They are rare. Sometimes cars hit them accidentally and kill them as the cat crosses the road. It is a shame as there are so few in the first place. A lot of people are frightened of the cougar. Cougars have attacked people but it is very rare. About twenty people have been killed by a cougar in North America in the last 121 years. Most of the people killed are kids who are on their own. People are more likely to be killed by a domestic dog or a snake. 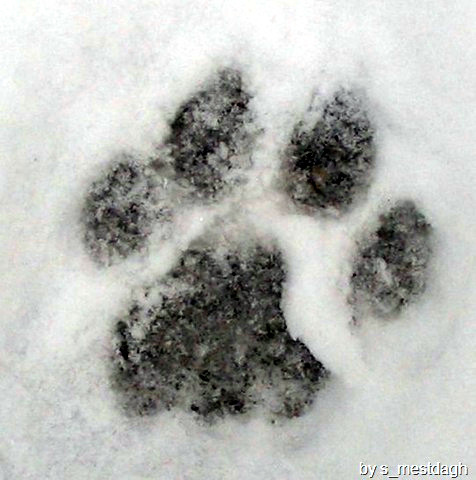 In one year alone more people are killed by dogs than by the cougar over 121 years. It is possible to stand up to a cougar and force it to go away. A lot of people think this is better than shooting it. The cougar is a shy cat. Quite a lot of people in America keep them as pets. A mother cougar will be pregnant for 92-93 days and give birth to about 2-3 kittens. The cougar lives for about 8 years in California, quite a short life. If they are in a zoo they can live much longer at up to about 20 years. Cougar in Brazil is published on Flickr also.